HÀ NỘI —Vietnam News Agency (VNA) General Director Nguyễn Đức Lợi yesterday called for training co-operation with French wire service AFP. Meeting with AFP CEO Emmanuel Hoog in Hà Nội, Lợi said VNA had several French-language publications including the French version of the online VietnamPlus e-newspaper and the Le Courrier du Vietnam, and their reports and editors would benefit from training in language and journalistic skills. He also proposed that VNA and AFP explore the possibility of co-operating in multimedia training. The VNA leader lauded the effective co-operation of the AFP over many years through the provision of quality media products to the VNA. The AFP is an important source of world news for the VNA and other media agencies in the country, he said. Lợi also briefed his guest on Việt Nam’s hosting of the APEC Year 2017, saying the VNA was willing to provide the AFP with information on various events held throughout the year, as also assist AFP reporters in covering those events. Hoog said that his visit was an opportunity for him to get VNA’s feedback on the quality of AFP products. He informed the VNA leader about the expansion of AFP’s network in Asia, including its aim to diversify its information products. 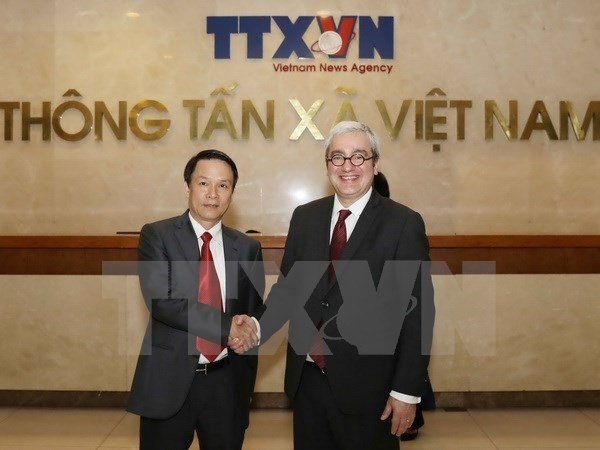 He agreed with Lợi’s proposal about collaboration in training French-language editors and reporters, and asked the VNA to give more specific details. Hoog also said that he hoped the two sides would continue expanding their partnership to cover more media products and forms. The VNA and AFP have co-operated in the form of information provision contracts including English and French news and news photos. The AFP has also shared professional experience with the VNA and helped the Vietnamese State-run news agency study organisational models of international media agencies. The VNA is now the media agency with the largest number of media products and forms in Việt Nam with more than 60 media products: bulletins, photos, dailies, weeklies, monthlies, magazines, pictorials, books, a TV channel, infographics, audio programmes, e-newspapers, and information programmes on mobile platforms and social networks. The agency also delivers news in the largest number of languages. In addition to official Vietnamese-language news provided to domestic and foreign media outlets, stories for foreign services are written in English, Chinese, French and Spanish. It has print and e-newspapers in eight other foreign languages: the four mentioned above, and Lao, Korean, Japanese and Russian. This is why the VNA is now regarded as the most important Vietnamese external news centre, the host was informed.